Today, friends and I got together to make tamales! It was a great day and a lot of fun to sit and talk, while making tamales. 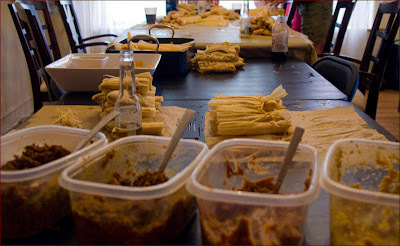 Making tamales is usually a very lengthy and time consuming process. Each component of making tamales can be done in advance, which makes it easy when you have friends over to make/assemble them. Prior to everyone coming over, I made the fillings, masa and soaked the corn husks so all that we needed to do was assemble them. In a stand mixer with your paddle attachment, mix the lard or butter/margarine until fluffy. Alternate adding the masa flour and chicken broth/water in the stand mixer with the salt. Continue mixing the mixture until your dough comes together. To check whether your dough is ready, take about 1/2 a teaspoon of the dough and place it in a cup of cold water. If the dough floats, the dough its ready. To prepare the corn husks for tamales, you will need to soak them for 30-45 minutes in hot water. I filled up my large 20 qt stock pot with water and heated it up to a boil. I then turned off the heat, placed the husks in the pot until they were fully submerged, topped the husks with a heavy plate (to keep them submerged) and covered the pot. After 30-45 minutes, I pulled the husks out with tongs and placed them in my large roasting pan. This made it easy to bring to the table for folks to use the husks. 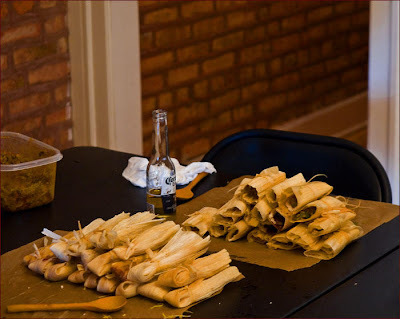 There are so many ways to assemble tamales, but for my event, we kept it simple. To assemble, spread a heaping tablespoon across the widest part of the corn husk. Spread it to a nice thin layer. Down the middle of the masa, place your filling in a line, being careful not to overfill! Take the sides of the tamale and fold it over towards the middle. Fold up the narrow bottom and tie it with a sliver of corn husk. I'm sure if you did a search online, you'll find so many fun and different ways to package these tasty tamales. Now that you have your tamales made, you'll want to steam them in a large pot with a steamer basket. If you don't have a large pot with a steamer basket, crumple a large piece of foil into a ball and place in a wok, dutch oven or the largest/deepest pot you have. Place your tamales inside the pot and have it lean against the foil ball, all the way around. Carefully fill the pot with water until you have an inch of water. Cook over high heat for 45 minutes to 1 hour, covered. Check the level of the water every so often to make sure it hasn't completely evaporated. The tamales are done when it peels away from the corn husk easily and the masa turns a slight shade of yellow. If you need some visuals, here is a link with some step by step pictures and thorough explanations on how to make tamales. I have been craving tamales for weeks now. I just lack the time to make them. My friends would never come over for a tamale party. I'd have to pay them! Everything looks great, especially that cake! Oh YUM! I cannot tell you how much I love tamales. I have been scared to make them at home - both because of the prep time and the lb of lard lol. Of course that's part of why they are so incredibly tasty. These fillings all look great! Ok, I think you've inspired me... I need to make tamales at home. They are my fav mexican food, and your combos look delicious. Now that it's getting to be fall and things are slowing down, I think I"ll have time again for cooking projects like this! I love the different fillings specially the salsa verde,chicken, and lime, yummy. I see your Tasty Tools is bakeaware. I just made frozen brazo, I'll try to submit it. You always have the most creative parties! That sounds like a lot of fun. I agree - Blogspot is easy to use and comfortable. you look like you were really busy! I love tamales. Need to make them again soon. 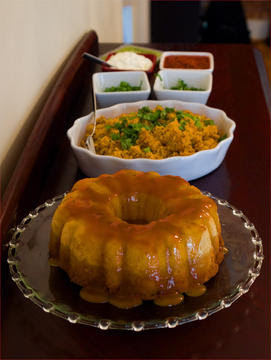 Y tres leches also! I have a great recipe I haven't tried! Nice party. Everything looks great but that cake looks fantastic! I love goat's milk cajeta. Thank you so much for posting about tamales! We were going to make them Labor Day weekend but got too busy... I starred this post so I will for SURE remember to make some soon. And I want to try a couple different types. Yum! I have always wanted to make tamales at home! Everything sounds delicious and the cake looks yummy! Just a question - I've made the cake before using a devil's food cake mix. What does the coke do for the cake? Does it impart a different flavor or texure? These remind me of Christmas! Yum! We always have tamales on Christmas. I must have that cake. I MUST! What an awesome class. I wish I could have attended. I bookmarked your post so I can hopefully make tamales soon. Your cake looks delicious too. Flan is one of my favorites. WoW! What a production! I love that you're able to organize so many people and get so much food together! I need to host some days like this when the kitchen is back together. I'd love to try it with your dumplings! What a party! Looks like everyone had fun and the tamales look so good! Oh my goodness, these combinations sound SO yummy! I bet there were fabulous with that Mexican rice too. I definitely need to try that! This looks great (as usual)! Thanks for all the nice comments on my newbie blog as well :) Maybe one day soon I will work up the courage to participate in one of your blogging events! I have always wanted to make tamales. I'm bookmarking this so I can give them a go sometime this fall. Looks like a really fun party! i have always wanted to make tamales but have always found it so time consuming i have shied away! Everything looks delicious! Did you have trouble finding the masa flour? Looks like a really grand party! I did some great tamales sometime back but am getting the urge to try some more. These look like grand fillings.